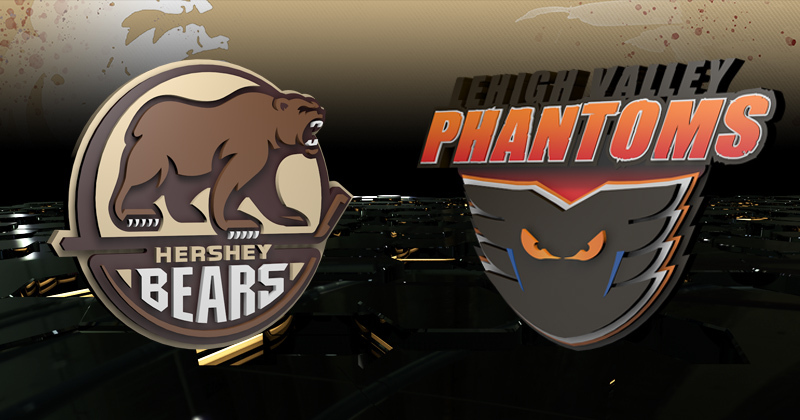 Game Preview: Phantoms at Bears, 5 p.m.
01/13/2019 - Tonight, the Hershey Bears rematch against the Lehigh Valley Phantoms following a 3-0 win last night at the PPL Center. RADIO: WQIC-100.1 FM, Fox Sports 1460-AM, WOYK-1350 AM, Voice of the Bears Zack Fisch, Freddy Cassivi and Jim Jones on the call. The Hershey Bears and Lehigh Valley Phantoms kicked off a home-and-home stretch last night on the road. The Bears snapped a nine-game losing streak at the PPL Center with a 3-0 shutout win. Ryan Sproul scored the game's first goal and eventual game-winner at 2:58 of the second period, after burying a drop pass from Juuso Ikonen. Riley Barber added a pair of 4-on-4 goals later in the frame to cement a 3-0 victory. Hershey's penalty kill bounced back from a 3-for-7 performance on Friday in Springfield with a perfect 3-for-3 night. The Bears will go for a second consecutive win versus Lehigh Valley this evening. The last time the Bears beat the Phantoms twice in a row in the regular season occurred back in the 2015-16 campaign. Hershey won its final three meetings with the Phantoms that season, including closing the year with an 8-0 lopsided win on Mar. 23, 2016 at the PPL Center, and scoring a 4-2 victory on home ice on Apr. 16, 2016. In the 2017 Calder Cup Playoffs, the Bears also earned back-to-back wins over the Phantoms, taking Game 1 of the best-of-five series 1-0 in overtime, and finishing a comeback to win Game 2, 5-4, at the PPL Center on Apr. 22, 2017. Hershey netminder Ilya Samsonov stopped all 18 shots he faced last night to earn his first AHL shutout. After early season struggles, Samsonov has hit his stride in his past four appearances, posting a 2-1-0 record with a 1.69 goals against average and a .915 save percentage. The Russia native was selected in the first round, 22nd overall, in the 2015 NHL Draft. In his first season in North America, the 21-year-old has a 6-11-0 record with a 3.60 goals against average. Forward Juuso Ikonen added an assist last night for the Chocolate and White on Ryan Sproul's game-winning goal. The forward has points in both games this weekend after scoring in Springfield on Friday. Ikonen has points in three of his past four games (one goal, two assists) for the Chocolate and White. In his first year with the Bears, Ikonen has struck for nine points (two goals, seven assists) in 27 contests. Forward Riley Barber collected his second multi-goal game in as many weeks with a pair of second period tallies yesterday. He also fired eight shots on goal last night, the most in a single-game by any Bears player this season. Barber leads the Bears with nine multi-point games this season, and is currently in the midst of a four-game point streak where he has collected seven points (four goals, three assists). Barber has points in seven of his past eight games, striking for 12 points (six goals, six assists) in that stretch. He leads the Bears with 31 points this season and now has 151 points in 205 career AHL games.